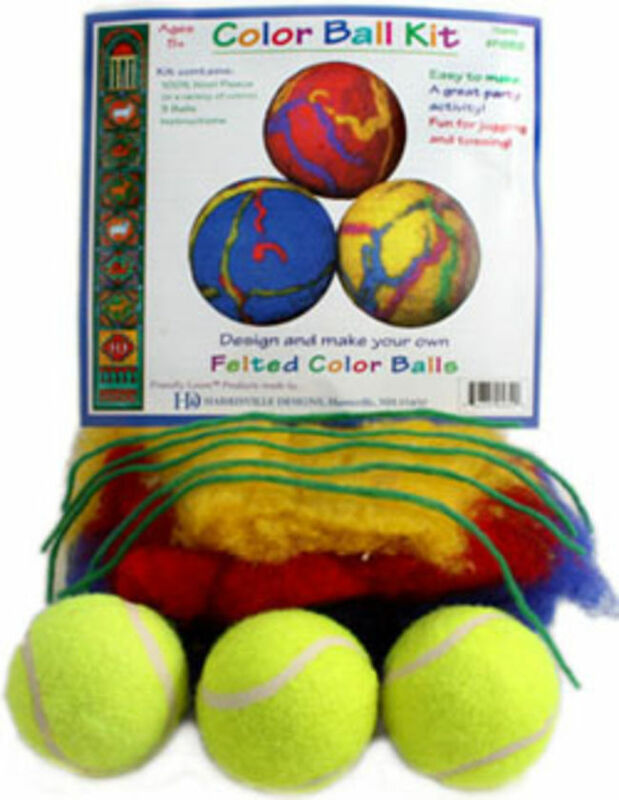 Design and make your own felted color balls. Easy to make. A great party activity. Fun for juggling and tossing! 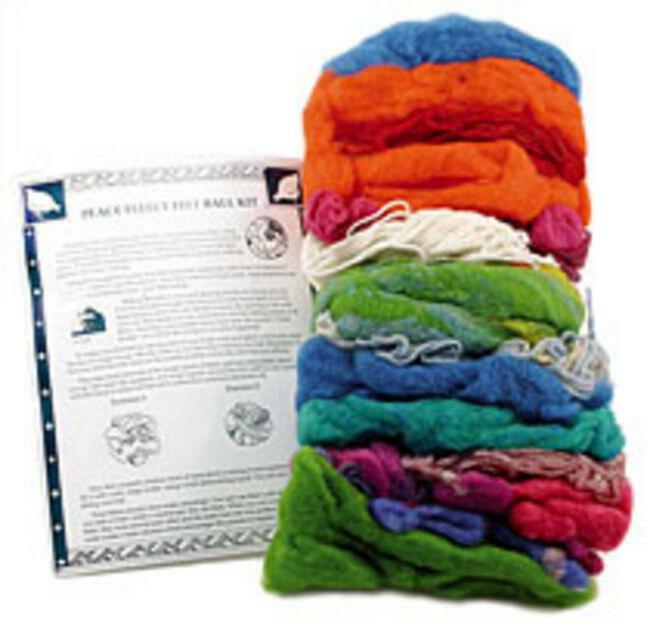 Kit includes: 100% wool fleece and adornments (in a variety of colors), 3 balls and instructions. 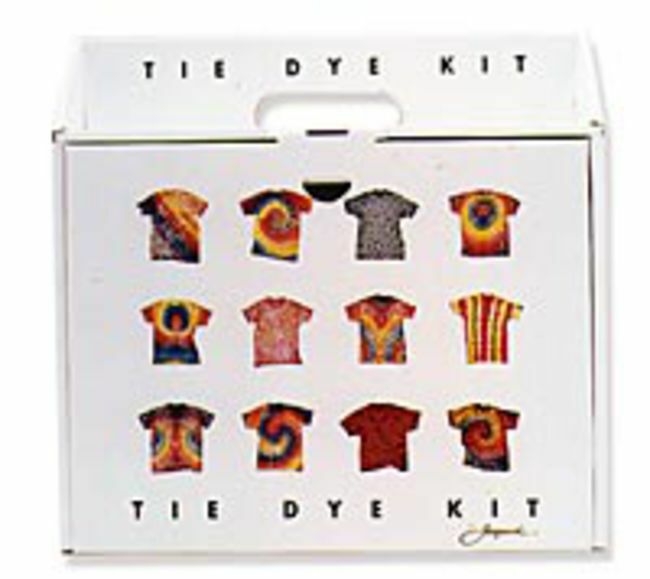 Kids and adults will have a blast making tie-dyed T’s with the Tie-Dye Kit. There’s enough dye and assistants for 15 shirts — you could throw a party! Kit comes complete with rubber gloves, rubber bands, 4 squirt bottles with pre-measured dye (yellow, magenta and blue) and soda ash. You supply the 100% cotton t-shirt. 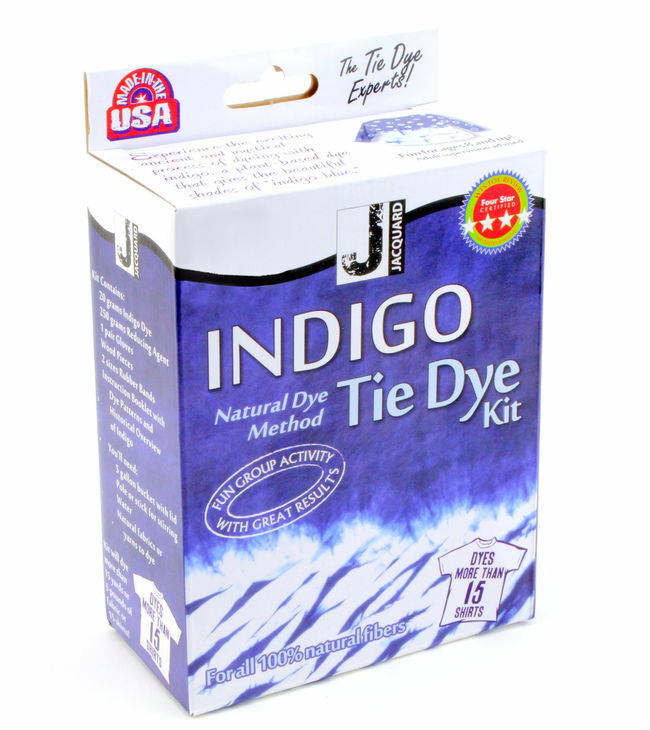 Kids and adults will have a blast making Indigo tie-dyed T’s, shirts, skirts and more with the Indigo Tie-Dye Kit. 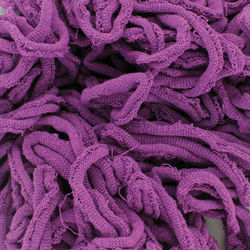 Kit will dye more that 15 yards or 5 pounds of fabric or 15 shirts! Comes with rubber gloves, rubber bands, wood pieces, instructions and is for use with natural fabrics and clothing. 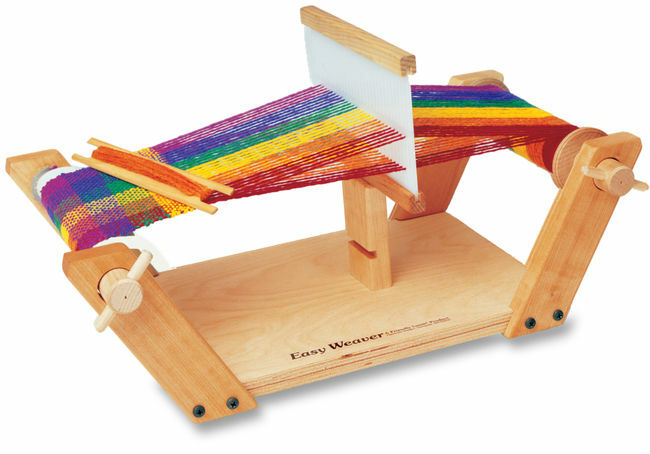 The rainbow refill for the Easy Weaver 7.5" weaves a total woven fabric equals 6 inches by 2 1/3 yards and can be made into scarves, belts, placemats, table runners, doll blankets, clothes, pillows and more. 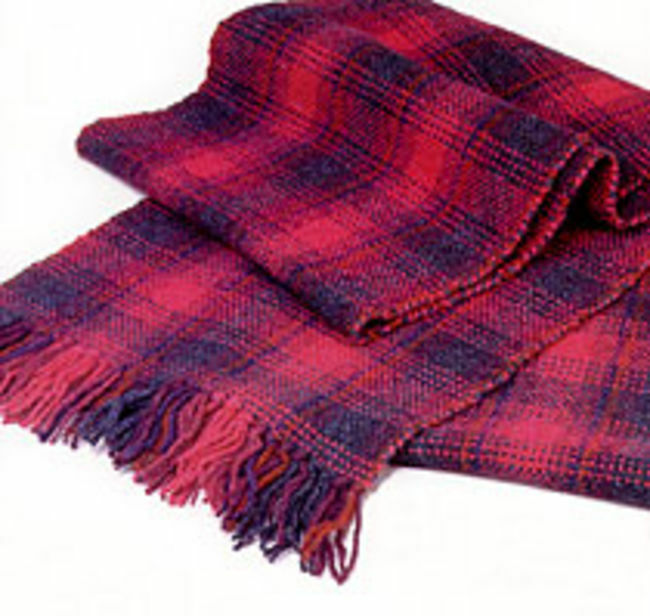 Here are easy to follow instructions for eight great projects including scarves, placemats, table runners and pillows that can be made on Easy Weaver looms. 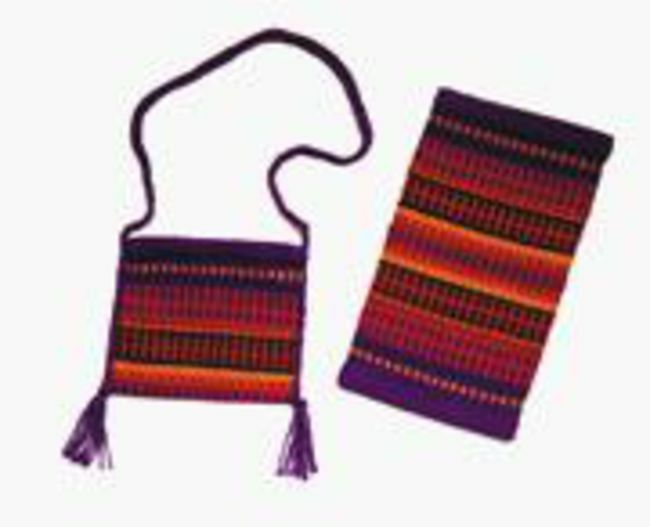 Harrisville&apos;s clever backstrap loom is based on Peruvian backstrap looms used for centuries to make colorful woven sashes, straps and bands. 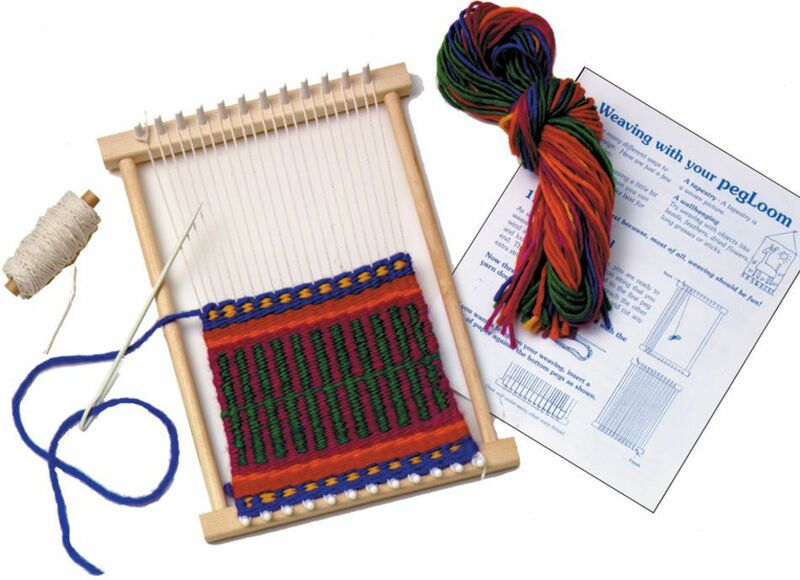 Kit includes sturdy hardwood clamp device with nylon belt, rigid heddle pre-threaded with 2 yards of cotton warp, cotton weft, shuttle beater, handy zippered carrying case, and illustrated instructions. Ages 9+. 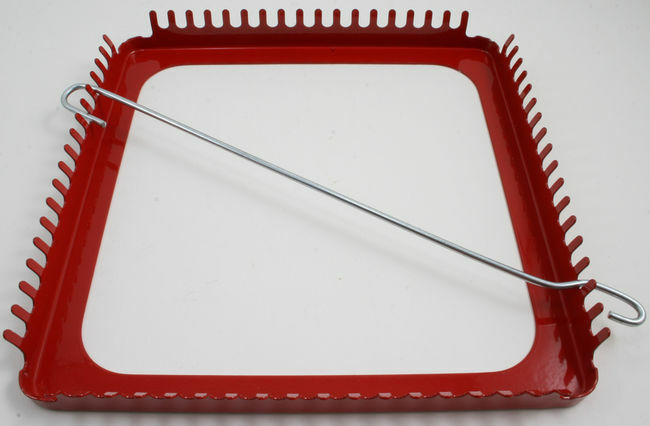 Lightweight and easy to use, a double duty shuttle and beater for backstrap weaving. A great little shuttle with clever offset indentations, and a little groove for holding the end of your yarn. 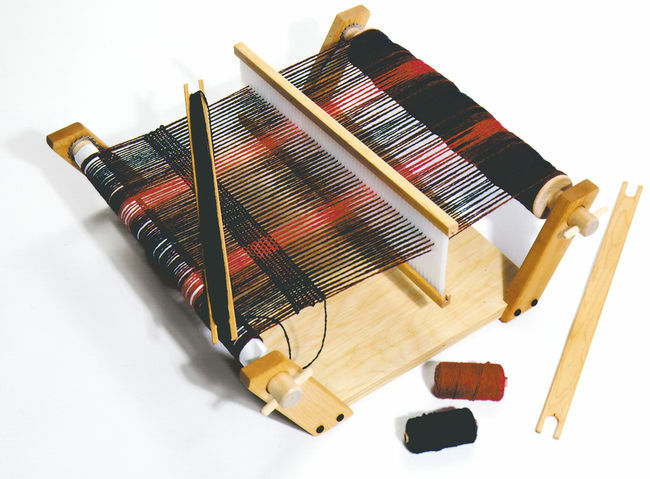 Use for weaving on many little looms, including, inkle, backstrap, smaller table looms, and rigid heddle looms. Use the backstrap shuttle beater to hold the weft yarn and beat the woven weft in place. 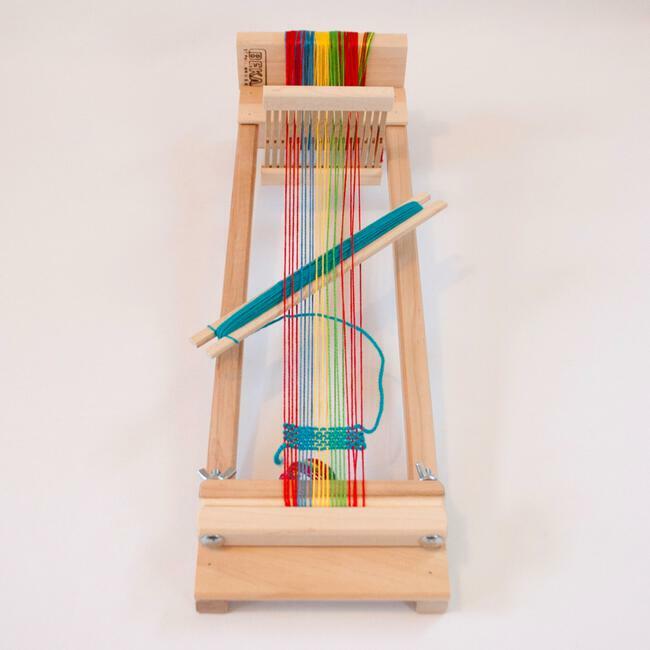 6" X 1.5"
Kids will have fun weaving guitar straps, headbands and belts on Beka’s 4" Rigid Heddle Loom. 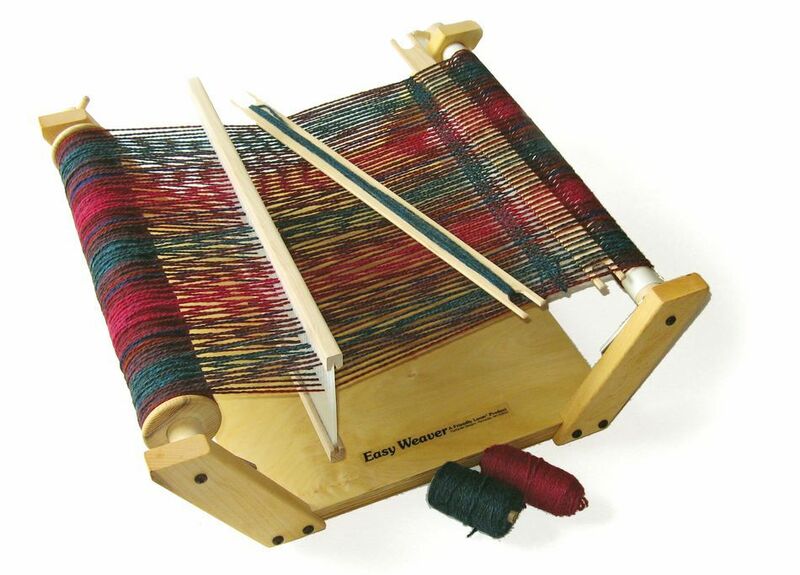 Fully assembled and pre-warped with colorful cotton yarn, the hardwood loom is used with one end in the lap and the other resting on a table. Warp is easy to advance and tighten. 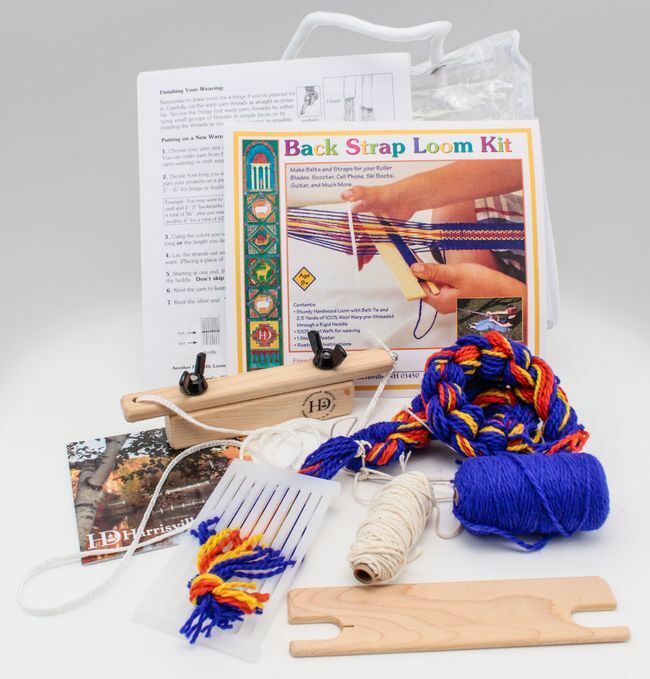 Loom comes with a 8 dent heddle, wooden shuttle, instructions and yarn. Age 7+. This is Beka&apos;s RH series. 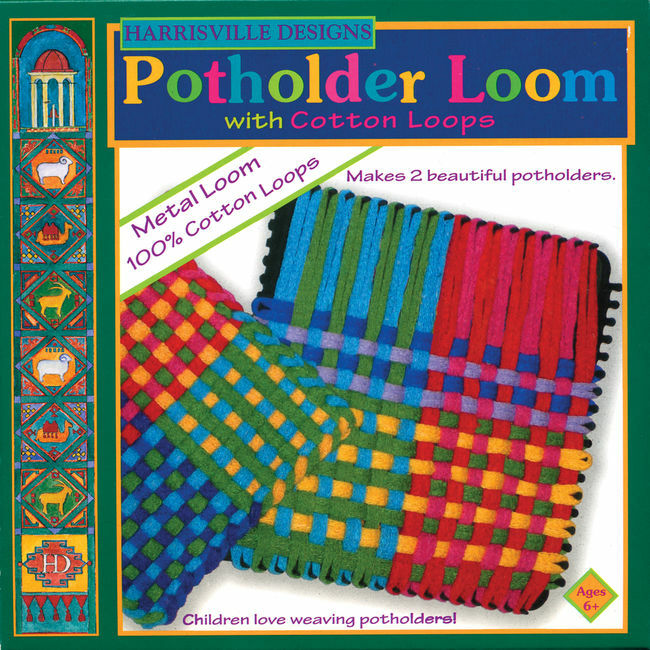 Kids, ages 7+, will have fun learning simple tapestry techniques with Harrisville’s Lap Loom. 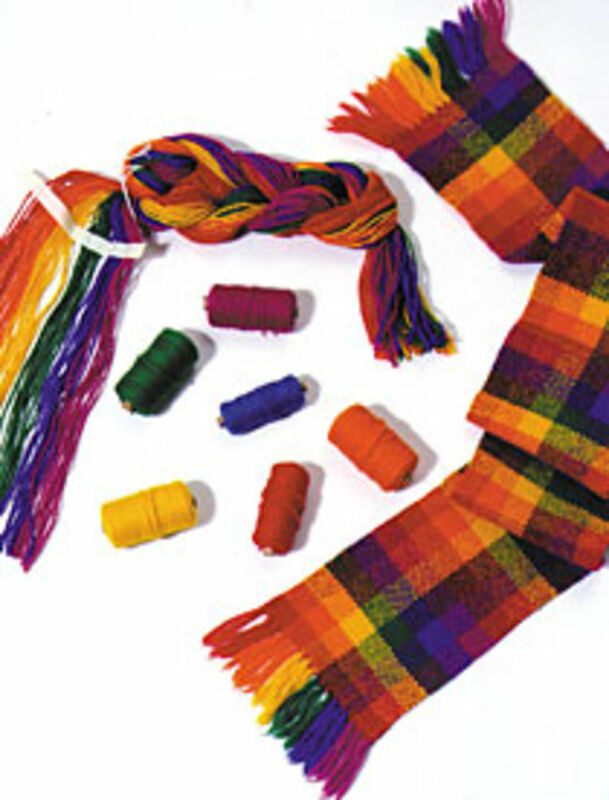 Great for car trips, school projects or rainy days at home, the Lap Loom teaches concentration and dexterity as well as weaving. 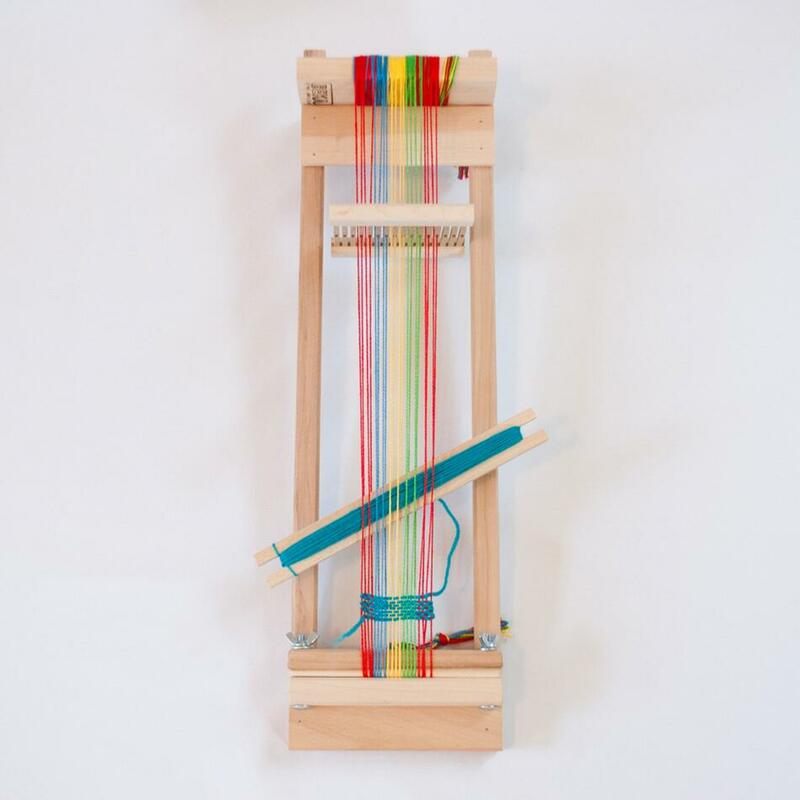 Each loom includes a stick shuttle, shed stick, instruction book, and enough yarn for one project. 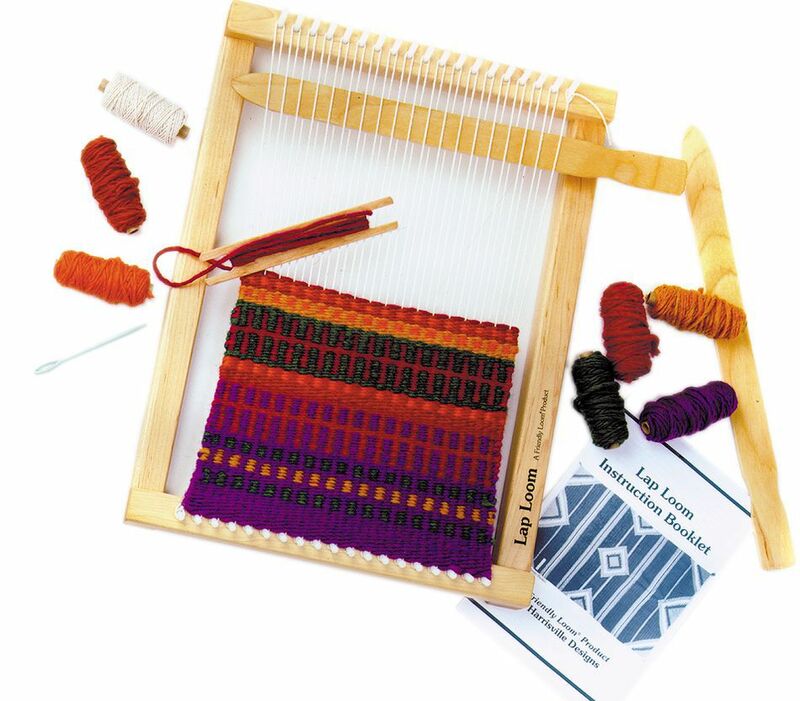 The Lap Loom Project Kits are designed to be woven on Lap Looms A or B. Beginners as well as more advanced weavers will find them rewarding and fun. Each kit includes detailed instructions and all of the yarn necessary to complete the project. Recommended for ages 12 and older. The Lap Loom Project Kits are designed to be woven on Lap Looms A or B. Beginners as well as more advanced weavers will find them rewarding and fun. Each kit includes detailed instructions and all of the yarn necessary to complete the project. 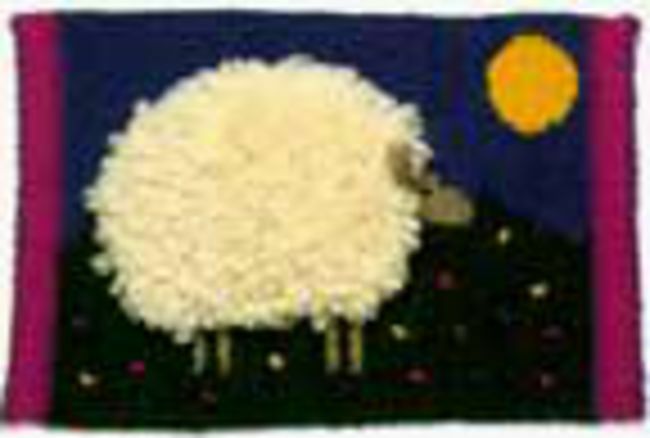 The Wooly Sheep wallhanging or pillow is a fluffy white sheep standing in a green field of multi-colored wildflowers. Blue sky and a bright yellow sun provide a warm contrast with pink and purple borders. Recommended for ages 12 and older. Pick out sheds on your Lap Loom faster and more easily with the Wonder Wand. 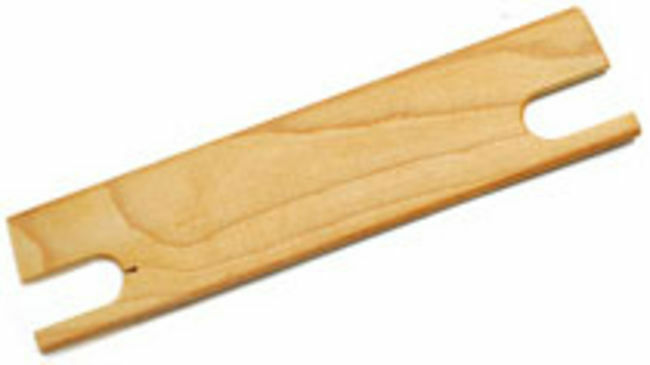 This simple wooden tool really helps to minimize frustration and make weaving more enjoyable for small hands. Measures 14 1/2" X 1 1/2". 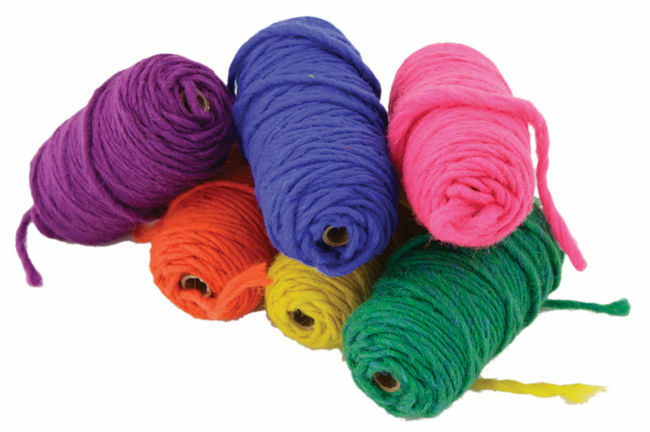 Six 2 ounce balls of Harrisville&apos;s Designer yarn in bright bold colors for creative young weavers. The perfect weft yarn for working on the lap looms. 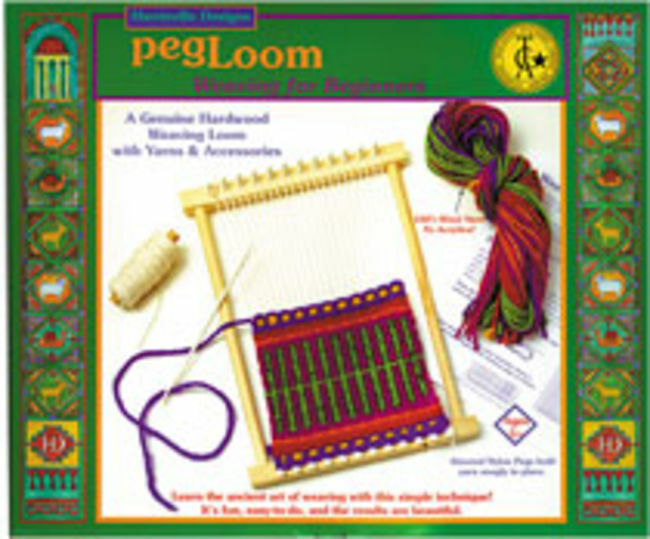 Simple but sturdy, Harrisville’s hardwood peg Loom is designed with the youngest weavers in mind. 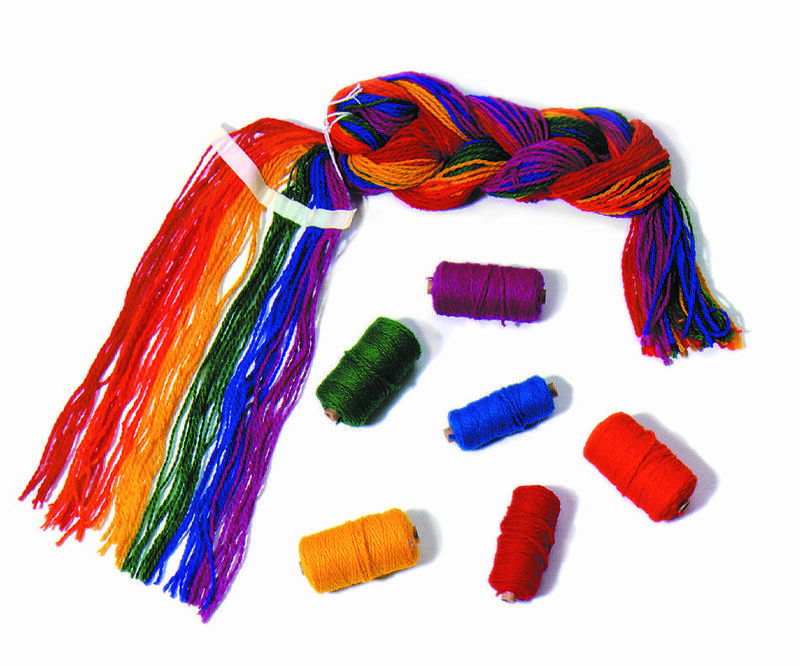 With a helping hand, kids can wind a warp between the two rows of strong nylon pegs, thread the large eye plastic needle with fat colorful yarn and weave the weft over and under the warp. 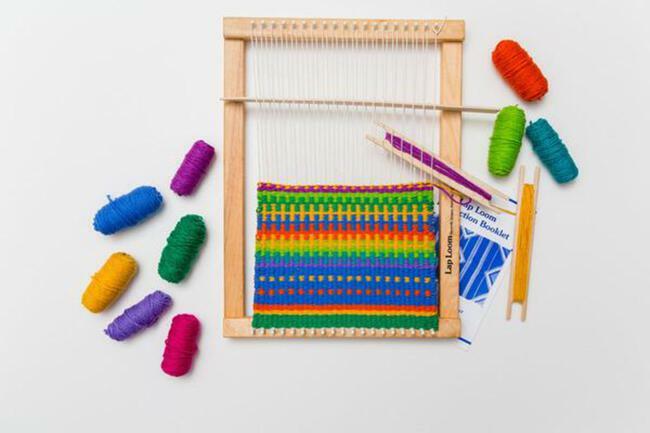 The small 5 1/2" x 9 1/2" weaving area makes it easy for children to complete projects. Age 5+. 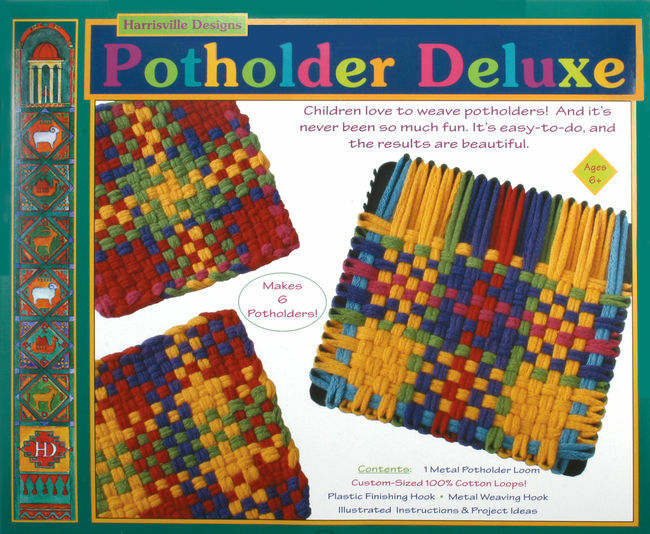 Make potholders with this easy-to use frame and colorful cotton loops. 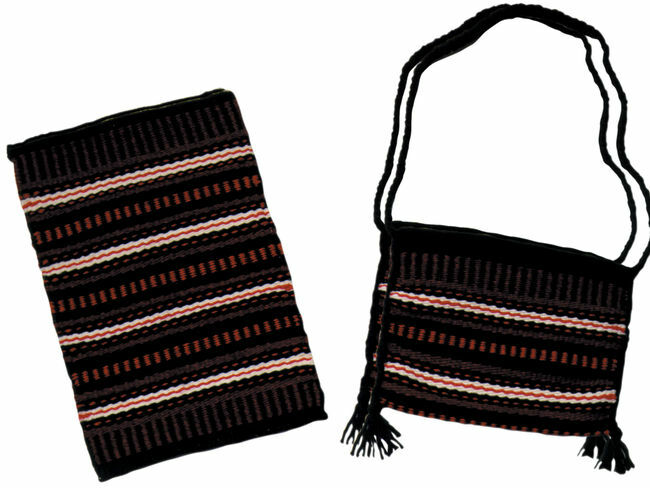 Kit comes with metal frame, hook and enough cotton loops to make two potholders. Finished size 6" X 6". 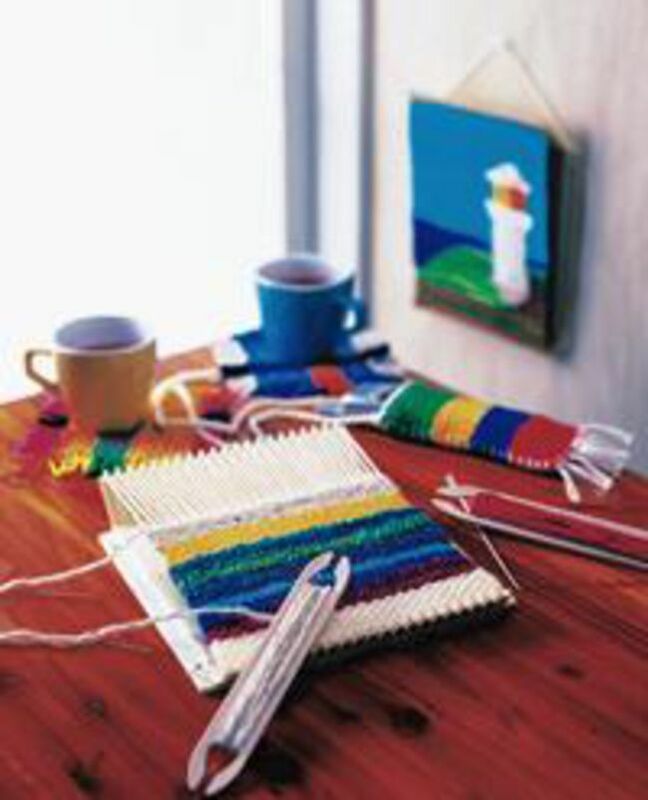 Make potholders with this easy-to use frame and colorful cotton loops. 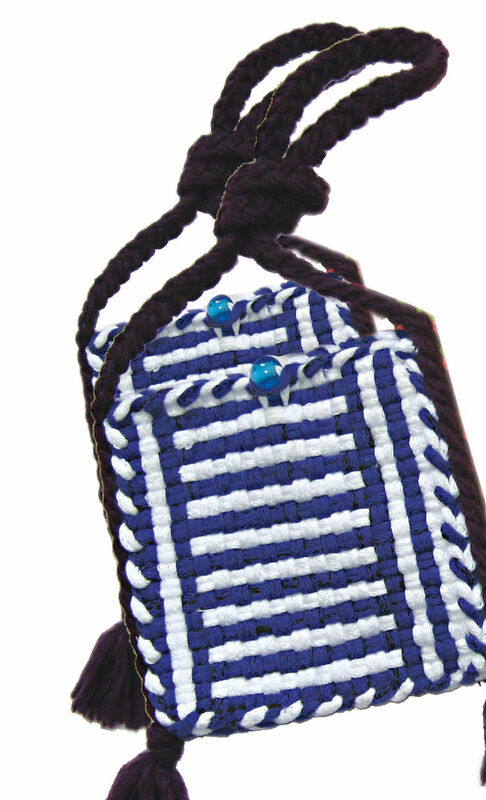 Kit comes with metal frame, hook and enough cotton loops to make 6 beautiful cotton potholders. Finished size 6" X 6". 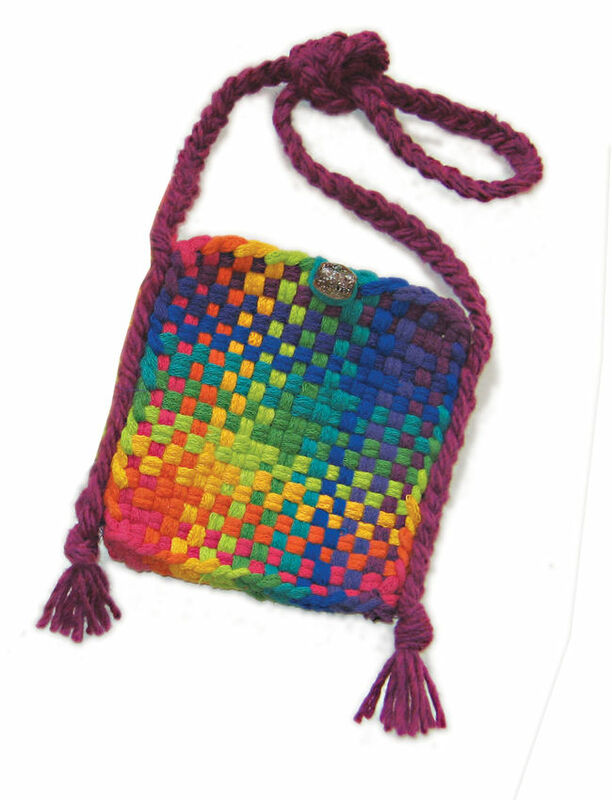 Enough cotton loops in great colors to weave two potholders which can then be sewn together to make an attractive and useful little purse. Comes with metal frame(7"X7"), cotton loops, wool yarn for strap, glass bead for button, two hooks (one for weaving & one for finishing), and illustrated instructions. Schacht&apos;s mini loom is all set to weave. 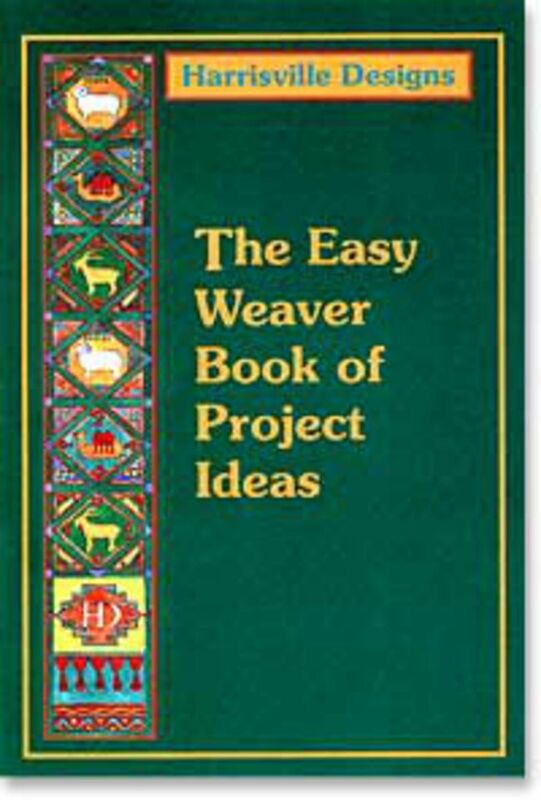 Comes complete with loom, 2 shuttles, weaving needle, beater, 5 colors of yarn and instructions for two projects. 6.5 in weaving width. All parts and tools are plastic. 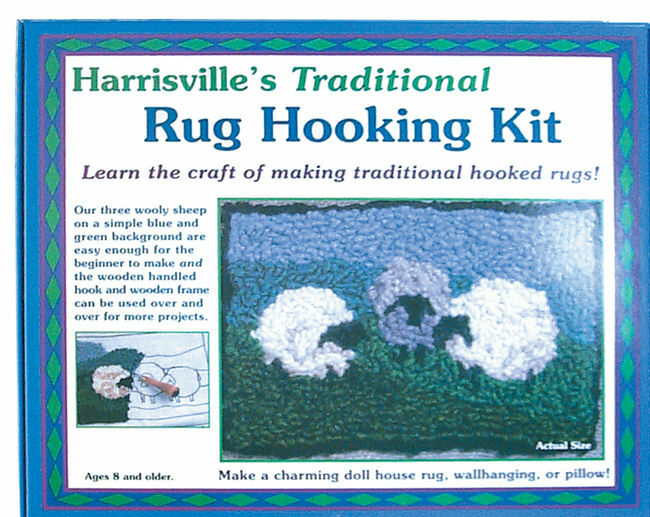 Harrisville&apos;s kit contains a reuseable wooden frame, canvas, rug hooking hook, 100% wool yarn and complete instructions for hooking three wooly sheep on a simple blue background. Easy enough for a beginner. Finished hooked project suitable for a doll rug, wall hanging, or pillow. finished piece 5 1/4 by 7 1/4".